Medicare, contraception, "Obamacare": Take your pick of partisan public battles in Washington this election season. Democrats and Republicans alike use them to score points and eek out victories in public opinion, and at the voting booth. But there's a much more pervasive partisan battle operating behind the scenes in virtually every state ahead of the 2012 general election, and it is provoking involvement from everyone from the nation's highest court to the U.N. Human Rights Council: voter identification. In state after state, Republican legislative majorities and governors are passing legislation calling for stricter identification requirements at the polls to weed out voter fraud and protect fair elections, provoking fierce pushback from Democrats and voting rights advocates who claim disenfranchisement. Since January 2011, 13 states have passed more restrictive laws regarding government-issued photo identification requirements for voting, according to the Brennan Center for Justice, a voting rights advocacy organization that is fighting back against voter ID laws. And both sides of the debate chalk up the rise of stricter ID requirements to an influx of Republicans and conservatives in legislative offices around the country. "There are more people in political office that care about it," Hans von Spakovsky, a senior legal fellow at the conservative Heritage Foundation and a voter ID advocate said in a recent interview with Yahoo. Voting rights advocates say the recent uptick in voter ID laws is due not to an increase in voter fraud, but to political agendas. They hold that new Republican majorities, boosted by conservative think tanks, are actively disenfranchising minority, elderly and young voters who are more likely to vote Democratic. And so they are pushing back. Take the latest gambit by the NAACP: In a maneuver that offered no direct potential outcome other than inviting public scorn, the organization last week petitioned the United Nations to examine contested voter ID legislation in Texas. "Historically, when people have come after our right to vote, they have done so to make it easier to come after so many of our other rights that we hold dear," NAACP president Benjamin Todd Jealous testified in front of the U.N. Human Rights Council. The NAACP is hoping the attention of the council—which has no jurisdiction over American laws or its legal system—will direct international shame to the Texas law. "There's no question that it could have a very big impact on the election in 2012," Lawrence Norden, director of the Brennan Center's Democracy Program told Yahoo News. The Center, which is involved in legal challenges to voter ID legislation across the country, says 13 states have passed or are on the verge of passing legislation this cycle that may impact the 2012 election. That means 189 electoral votes in this year's presidential race—or 70 percent of the total required to win the presidency—will be from states affected by a new law, according to the center. Voting rights advocates also point out that these new laws in Texas supplant previously accepted forms of ID, such as student IDs and voter registration certificates. The NAACP argues that this shift will disenfranchise hundreds of thousands of Hispanic voters in places like Texas, who lack the money, transportation or documentation to obtain accepted identification. Other demographics are similarly challenged: In the South, many elderly African-Americans do not have valid birth certificates because laws at the time of their birth forbid them to be born in hospitals. This makes securing state-issued photo IDs difficult if not impossible. Norden isn't arguing that none of these aforementioned groups will be able to obtain a required ID before Election Day this November, but these new voter ID laws hold the potential to greatly skew the election. "It could make it significantly more difficult for 5 million Americans to vote in 2012," he said. 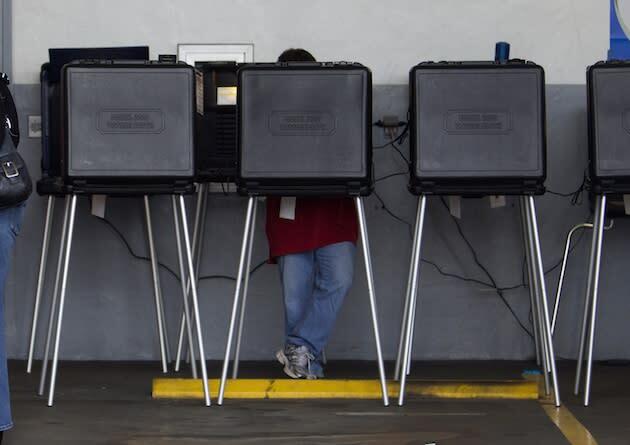 "The intent behind this law is to limit minority participation and voting rights," Gary Bledsoe, president of the NAACP Texas State Conference, told Yahoo News. Bledsoe cheered the national NAACP's effort to involve the U.N. in his state's case, as well as the Justice Department's decision to block preclearance for the law. But von Spakovsky and other voter ID supporters say there is no desire to disenfranchise people, instead there is a noble desire to protect fair elections from fraud. Von Spakovsky noted that government-issued photo IDs are required for many activities in America. "For them to get to Geneva, they had to show a government-issued ID to get on an airplane," von Spakovsky said of the NAACP delegation that traveled to Switzerland to appear before the U.N. Human Rights Council. "I don't see that being much different than voting." An ID is required to fly commercially, purchase alcohol, buy pseudoephedrine at a drug store, etc. But for Norden and others, there's a world of difference between a choice activity and a protected right. "Voting isn't the same as purchasing a bottle of Sudafed or ordering a drink—it's a constitutional right!" Norden said. Voting rights advocates argue that premising stricter voter ID requirements on potential voter fraud is ludicrous. But there are many documented cases of voter fraud in the United States. Just two weeks ago, von Spakovsky notes, a sheriff in West Virginia and another Lincoln County official pleaded guilty to absentee ballot fraud. And there have been well-documented cases of voter impersonation—using names of the deceased, invented names and others to commit fraud. The Brennan Center last October estimated that over 5 million voters could be disenfranchised in 2012 due to stricter voting rights legislation, and that was prior to several additional states passing voter ID laws. On the other side of the issue, cases of fraud that have been identified in the legal system are much lower. In the last major election cycle, 2010 in Florida, PolitiFact found that there were 10 cases of potential voter fraud under investigation by the Florida Department of Law Enforcement. Whether stricter voter ID requirements will suppress voter turnout is a difficult case for either side to make because so many factors affect voter turnout. For now, many states' voter ID rules remain in flux prior to Election Day. Texas Gov. Rick Perry is vowing to bring his state's voter ID law all the way to the Supreme Court in the hopes of settling the case in time for the general election. Norden and others argue that the best way to combat voter fraud in today's world is to tackle the source of the problem and modernize the United States voter registration process. According to Pew Center on the States study released in February (pdf), approximately 24 million voter registrations in the United States are invalid or inaccurate, over 1.8 million registered voters are dead, and 2.75 million people are registered to vote in more than one state.